Matt's new bass boat is almost done! Every last wire was removed from the boat and an entire new wiring harness was installed. When they said this was going to be a ground-up restoration they meant it! New electronics, trolling motor, jack plate, talons, and more! The boat itself is an '08 Champion 210 Elite. The 210 is arguably the best rough water bass boat ever built. In order to make this boat travel worthy for years to come, the guys have stripped it to the ground and are rebuilding the boat one piece at a time. They work is almost complete so it was time for an update. The components that have (or will) be installed, are broken down below. Happy New Year! What's Happening in 2019?? Happy New Year! Did you achieve your fishing goals in 2018? Do you have new goals for 2019? We want to hear all about it! Leave us a comment below and let us know your goals. Goal setting is one of the biggest keys to success. Without clear goals you will flounder and lose focus. Set clear goals in life and in fishing for 2019 and it will be one of your best years yet! 2018 was a difficult year for us as individuals but a fantastic year for TacticalBassin. None of it would have been possible without the love and support from all of you! We look forward to an amazing 2019 as we continue to bring TacticalBassin to a lake near you. Follow along and be sure to come see us when we're in your town! Best Fish Catches of 2018! 6 lb Smallies, Giant Largemouth, Record Catfish! Merry Christmas! We've assembled our top fish catches of 2018 for you in a quick highlight reel. This time of year is about family, friends, and good memories. Its been an exciting year and we appreciate you coming along with us. Thank you for your continued support! The fish in this highlight reel were caught all across the country. 2018 was supposed to be the year of travel and despite some serious hiccups, we still made it happen. Come along for the ride, its only going to get better! Below is a breakdown of the baits and gear used to subdue these 4 giants. Matt is recovering nicely from his horrible accident and the Doctors have cleared him to do some light fishing. 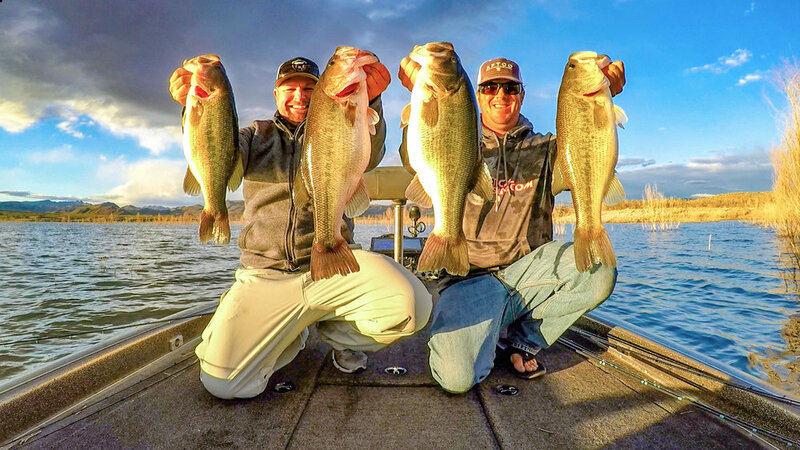 Come along for a few action packed hours on Clearlake throwing topwater! The smoke from the Mendocino Complex Fire (The Largest fire in California's history) isn't going to keep us from setting the hook on some big bass! Matt hit the water today after not being on his boat since mid May! He's a little rusty and has a long way to go to recovery but the fish still cooperated. He combined the buzzbait, hollow frog, and soft body frog to catch a handful of really nice bass. Pay close attention to the tips on rigging a buzzbait and the best hook for frog fishing.